What Happens When You’re Mindfully Aware of Your Story? Mindfulness allows a person to access their stories – we see our personal narratives from an objective perspective. So imagine what happens when a person is also mindful of their talents. Mindfully connecting talents to stories, places a person in a position to choose the direction of their life. We can, quite literally, become the author of our story. A typical narrative begins with an orientation, follows with a complication and ends in a resolution – basic plot structure is simple, neat and definable. Although life is messier, many of the stories we tell ourself follow the same pattern. We’re in a situation, we have choices and those choices have consequences. Our stories form a sequence and when we recognise the pattern, we can formulate plans and, we can rewrite them. Often when we reframe the perspective, we change the outcome. 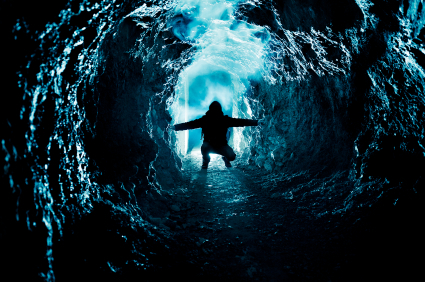 In other words we give ourself a new path, a fresh way through the wildness of thought, emotion and behaviour. Things that seemed random may suddenly fall into place. Being mindfully aware of narrative allows movement rather than staying stuck. Freedom comes from recognising you can actively and consiously move through the stories you’ve been telling yourself. Re-writing your story starts by recognising your talents! To put it plainly, wellbeing starts within. It begins by considering your unconscious programing – the neural pathways of innate thought, emotion and behaviour. It is possible to view these innate patterns in terms of talent themes. Using talent-based vernacular, the way you’re wired affects the way you build relationships, get things done, influence others and organize ideas. Your innate patterns have probably been the force behind your greatest accomplishments and most epic failures. Imagine having more conscious control. When a person is consciously aware of their talents and mindfully alert to their stories, they have tools to build internal and external connections. Arguably this process offers a foundation for the building blocks of self-efficacy; confidence, courage, creativity and compassion. Studies have shown that belonging, feeling connected and being recognised for contribution, places a person in a position to thrive. Building connection allows a person to contribute and this contribution fuels a sense of worthiness. However, and this is important, in order to thrive we need to feel valued for what we bring, what we are good at and what is important to us. 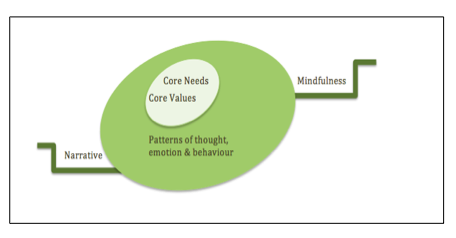 When we move a step further into this line of thinking, we see empowered connections are led by needs and values. They’re held by our talents, enabled by our stories and the whole process is strengthened by mindfulness. It is this interplay of mindfulness, narrative and talents that help us develop the communication skills necessary to build effective relationships and be part of something wider than ourselves. 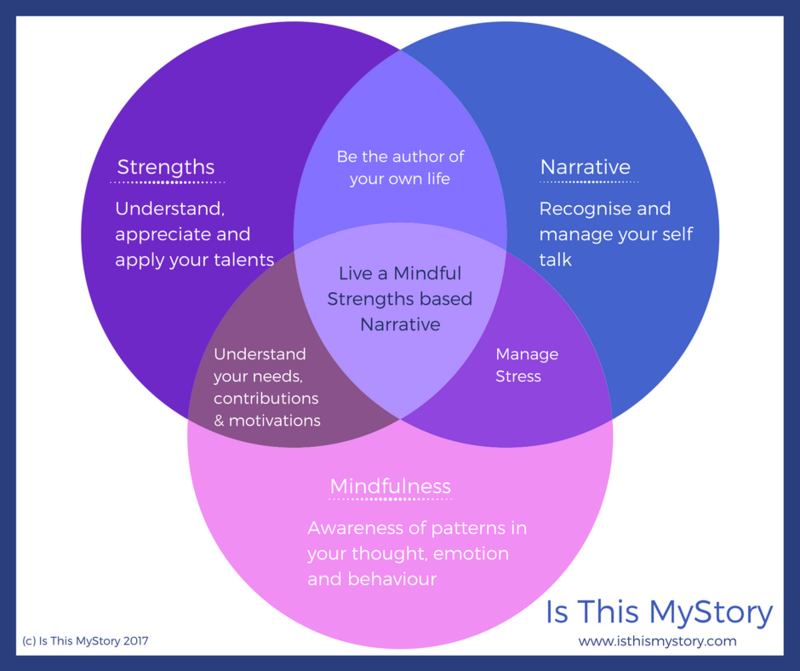 This diagram attempts to illustrate how a mindful approach to talents connects a person to their stories and allows for continuous personal (and professional) development. Our needs and values are at center. They’re in our heart and become the drivers, our ‘why’. Our motivations are contained within our innate patterns of thought, emotion and behavior. Mindful practice and narrative strategies offer turbines or handles. We use them to create conscious mental and emotional movement. This is an intentional process that allows a person to apply what they have inside to their outside. An individual can manage their destiny and choose to make things happen. 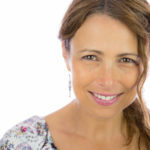 If you’d like to know more about improving your communication skills or gaining a greater awareness of your innate patterns of thought, feeling and behaviour, contact Nicole today, We’re based in Surfers Paradise and can arrange face to face consultations on the Gold Coast or Sydney. Alternatively ask about our Zoom sessions. Call today to arrange your complimentary Discover Purpose Narrative coaching session.